This small eating area (part of an open concept kitchen and great room) screamed utilitarian pit stop versus Sunday brunch escape for our Augusta, GA clients. Of course our clients wanted Sunday Brunch escape. After a lot of debate we exchanged the clean lined table and chairs for a farm style table from the dining room and started over. While the clients loved the natural light from the large windows, they wanted a little more privacy from the neighbors – and they definitely needed more color in the space. The addition of drapes out of a Ikat Suzani print, a wool and sisal rug from Design Materials, and a Lee Industries custom banquet covered in a Thibaut coral fabric warms the space and adds a punch of color and pattern. 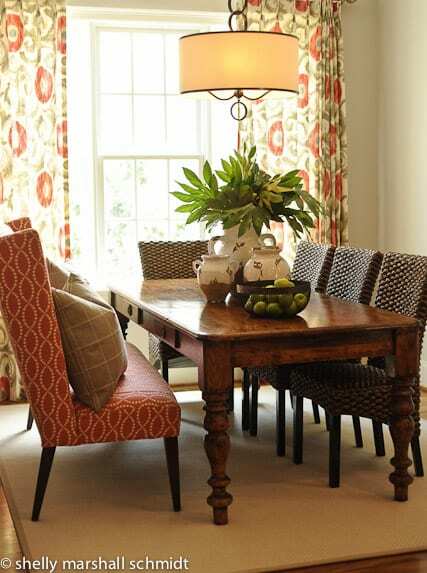 The seagrass side chairs add texture and fit well with the farm style table (stolen from the client’s dining room). A classic pendant adds the finishing touch. An inviting breakfast nook begging for you to peacefully begin your day! Does your breakfast room look a little bland? Visit Nandina Home & Design in Downtown Aiken or Inman Park in Atlanta to meet with our designers! Love the drapes I need that fabric !! Thanks for the positive feedback on our design projects. The fabric that we used for the drapes in the Breakfast Nook makeover is by Kravet. It is called Talish and the color is Misty Rose.